While out hunting buffalo one day, the great Wild West explorer Daniel Boone was captured by powerful Shawnee warriors. Enraged by the settlers' murder of one of their own, the Shawnee chief decided to take Boone hostage as revenge. 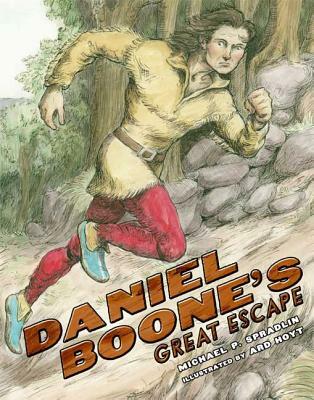 Even though he was eventually adopted by the Shawnee and grew accustomed to their way of life, Boone was constantly concerned about the safety of his family and friends. So when he heard that the Shawnee were preparing to attack the settlers in an attempt to regain their land, Boone decided to escape. Over four long days, he navigated the cruel landscape crossing wide rivers, hiding in tall grass or trees, covering his footsteps at every turn, and never looking back but all the while knowing that the angry warriors were in hot pursuit. This little-known episode from the life of one of our most famous Western heroes provides a balanced look at a difficult time in our history, while presenting a stunning act of courage that will keep young readers on the edge of their seats. Michael P. Spradlin is the author of numerous books for children including Texas Rangers: Legendary Lawmen, the Spy Goddess series, and the Youngest Templar trilogy. He lives with his family in Lapeer, Michigan, and, like Daniel Boone, he won't admit to ever being lost but will say he was mighty bewildered once for three days. He can be visited on the Web at www.michaelspradlin.com.Ard Hoyt is the illustrator of the New York Times bestseller I'm a Manatee by John Lithgow, among many other books. He grew up exploring the woods and fields not far from Chillicothe, Ohio, where Boone was held captive by the Shawnee long ago. This is his first nonfiction book and proof that truth really can be better than fiction. Ard was honored to tell this story in pictures with his good friend, Mike Spradlin.